Desiree says her long hair is too hot in the summer, so she has decided to cut it off- ALL OF IT!! We shot the haircut with 5 cameras, and all the footage is included in this amazing DVD. Is Desiree the most beautiful bald chick of all time? We think she'll get a lot of votes!! Karen is a 22 year old bartender in a progressive jazz club. She wants a progressive haircut that will show off her great facial features and attract lots of attention. We start out by cutting the bangs. 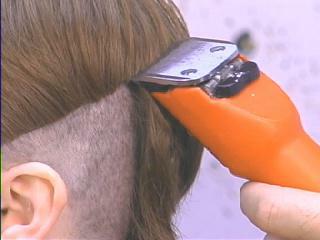 The bangs are cut in a curvy, asymetric style. Look how pretty Karen's ear is. You couldn't even see it before. 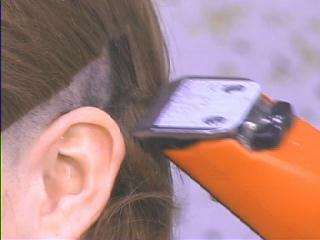 A sharp angle is cut with the clippers, well above Karen's ear. Yes, Mr. GP in Australia, THIS BUD'S FOR YOU!! Karen's hair is looking better and better as the clippers cut the new style high on the back of her head. Note the difference between this side and the other. Pretty cool if I say so myself. This one I gotta explain- In my efforts at humor, I told Karen I had never nicked a model more than seven times. This was her reaction to my "joke." I guess that's one joke I'll keep to myself next time. 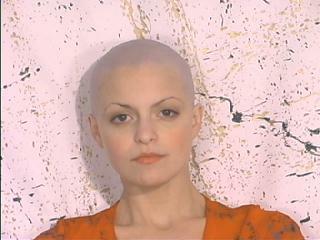 Karen is looking very foxy and ready to serve the "Shave 'em bald and gimme a beer" crowd. If you liked the pictures, you're gonna LOVE the video. Copyright Alfa Tech Video Productions, All Rights Reserved. All pictures, descriptions and videos featured on this site are the property of the Hair Enthusiast Hotline. None of the pictures on this site may be published on other sites without the written permission of the Hair Enthusiast Hotline. Any re-publication or other use of these copyrighted materials is strictly prohibited by law. Violators will be prosecuted to the fullest extent of the law. Copyright © Haircut.net and Alfa Tech Video Productions. All Rights Reserved. None of the pictures on this site may be published on other sites without the written permission of Alfa Tech Video Productions. Any re-publication or other use of these copyrighted materials is strictly prohibited by law.